This 3.25 mile point-to-point trail follows limestone and sandstone outcroppings and offers stunning views of Lake Worth interspersed with descents into shallow canyons. This is the park’s most difficult trail and hikers should be prepared for steep inclines. Benches are scattered along the trail and 3 shortcuts return hikers to Shoreline Drive prior to the end of the trail. Hikers must return to the trail head by walking along the road or doubling back on the trail. From loose sand to hard limestone this trail showcases the unique geology of the Refuge. Frequent bends and curves in the path create a feeling of seclusion while hikers explore different landscapes. Water seeps through porous sandstone creating small ephemeral streams and pockets of dense vegetation. 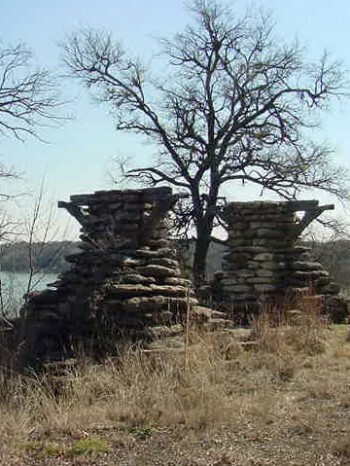 Rock structures built by the Civilian Conservation Corps during the 1930s perch atop two of the highest ridges. A steep set of 63 stone stairs also dates to this time period. Hawks and vultures are frequently spotted soaring along the ridgeline while smaller songbirds find refuge in the brush of the shallow canyons. During the winter, flocks of migrating waterfowl can be seen in the distance dotting the surface of Lake Worth. Pockets of wild flowers, including milkweed, are found on the high mesas in the spring. Beetles, butterflies, and bees are abundant when flowers are present. Yucca, Prickly Pear Cactus, and various grasses are also common.